If seeing the innermost workings of your pen, imperfections and all, is your thing, read on to learn all of the details. The M205 Demonstrator is a special edition release therefore it will only be available for a limited time. Available nib sizes will be the standard EF, F, M, and B done in an un-plated stainless steel. It will have the standard chromium-plated furniture that is characteristic of the M205 line. That furniture simply includes a single trim ring at the piston knob and a single cap band as well as the traditional pelican beak clip. Unlike the original release, the cap top of the new model will feature a chromium plated crown rather than black plastic. This has been a common distinguishing feature for many of the new and re-issued pens of the Classic line. The cap top will depict the company’s single chick logo painted against a black background. The M205 has a length of 4.92 inches when capped, 5.71 inches when posted, is 0.46 inches in diameter, and weighs around 0.49 ounces. These dimension make it very similar in size as the M400 from the Souverän line. The ink capacity of this model is quoted at 1.20mL. The suggested retail pricing overseas is 125 € for F, M, and B nibbed models and 138 € for EF models (VAT included). While prices will vary somewhat between vendors, those in the European Union can expect to pay about 100 €, including VAT. For those of us in the U.S. who can exclude the VAT, pricing will be around 84.04 € (~$102.55) for F, M, and B models and 92.77 € (~$113.20) for the EF model when purchased overseas. Unfortunately, Pelikan continues to demand a gratuitous premium for their EF nibs sold in the EU market. Retail pricing from U.S. vendors is currently not available at the time of this post. This release will only come as a fountain pen. Today’s announcement was somewhat of a surprise as this one was not widely rumored. While news of any new Pelikan is welcome, this one seems a bit, shall we say, safe. It’s true that the original M205 clear demonstrator is difficult to come by these days so those who like demos with silver colored trim will be happy to see this one come to market. Of course, many people do not like demonstrators due to their inherent nature of revealing all of a pen’s acquired imperfections. Now four pens into the 2018 season and I can’t help but be left wanting for something truly inspiring. There is still no word as to an Olivine M2xx release which is the one that I’ve been anticipating for a while now. 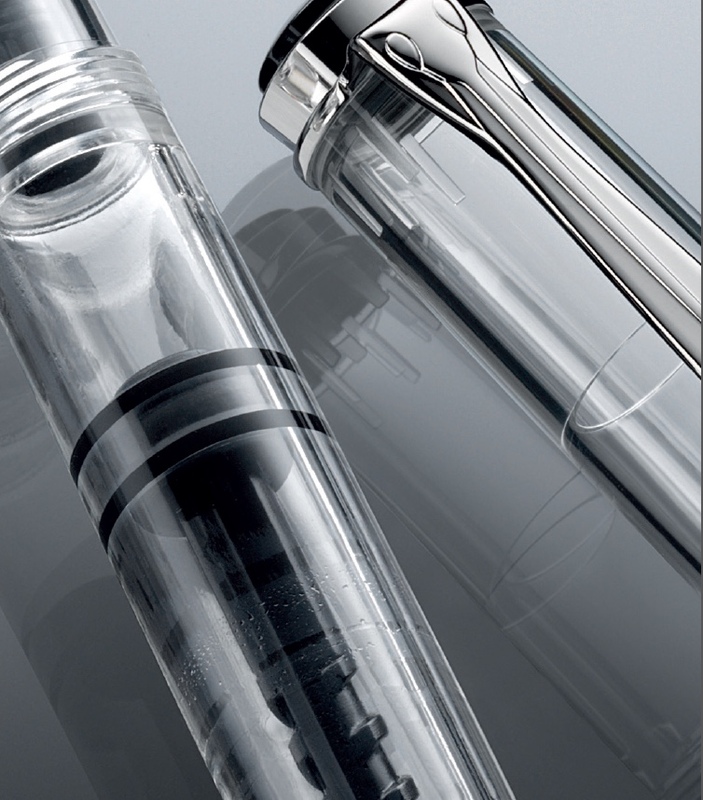 What are your thoughts on this new clear demonstrator? Will you be adding the newest addition to the Classic line to your collection? I am not too excited with the reissued 205 demonstrator. I have the original one from 12 years ago and no sense to get this one. I am very excited about the release – so far I couldn’t get my hands on a demonstrator and, being an engineer, I’d love to see the inner workings… I already have pre-ordered one. Congrats on the preorder. I’m a big fan of demos for the reason you state. Enjoy your new pen. Well, like you, I will almost certainly get this to complete my collection but overall I am underwhelmed. They seem to have a way to hook the collector. Sometimes being a completionist doesn’t pay. I have the blue demonstrator version M205 from 2016 and do not feel the need for this new clear version. However, for any readers yet to experience the Pelikan steel nibs on the M205 series, I can say that my broad nib ranks amongst my favourite nibs for smoothness and has a pleasing, slight bounce to it. Your description of the nib mirrors my experience. I love Pelikan’s stainless steel nibs and would put them up against many of my gold ones. I missed out on the earlier clear demonstrators, so I’m pretty pleased about this new release. I have the 2012 version and don’t feel the need for another. This offering just adds to my sense of bewilderment concerning the choices this company makes. Expect to see some logic, reason or trend but none of that peeks through the curtain. I am not at all tuned in to fashion or cultural trends perhaps there been a rising clamoring for this release. I doubt it. A cage full of monkeys with a dart board would have a better chance of selecting a more popular release. I think the recurrent theme of re-releasing past models will not serve them well in the long run. Well, your third sentence clearly conveyed your disappointment… 😉 (I sort of pictured you hitting your head against a wall.) and when I first saw this news on the Internet a couple days ago my gut reaction was “ho-hum.” Still, for those who don’t have a clear demo in their collection, I can see where this pen might be fun or interesting. I think the Iconic Blue M120 was quite nice in terms of color and style… but too expensive for what it is. And I’m hitting that stage of life where I just don’t write with FPs that much anymore… so my collecting desire is sort of waning… but that’s a whole ‘nother story. Still, it’s fun to keep up with your musings on the world of Pelikan… always a good read. Thanks! “Rather than something fresh and unique, Pelikan once again resurrects a model from the past.” You nailed it. More of a face palm though. I was hoping for a lot more excitement for an anniversary year. The last two releases have fallen flat for me and the iconic blue is awesome but horribly overpriced, as you stated. I will likely be passing for a variety of reasons, even though I think it is a very attractive pen – if a bit underwhelming. I don’t currently have a M205 in my collection, although I did have two at one time (black, toledo red) and would like to get another M205 sometime to go with my three M200’s. (old style blue marbled, brown marbled and cognac) But a clear demonstrator isn’t it. I doubt it would happen – at least in the short term, but a M205 Stressemann would be nice. Yet with the introduction of the pattern in the M405 I don’t see that happening either. Which means if I want a Stresseman, I am going to have to really step up my game from a budget perspective. And new ones are what $300 or so. That is double my current most expensive pen. The Stresemann is great but i don’t think it will ever come to the Classic line. We will see an M1005 in the pattern later this year. Seems like they expand the anthracite finish to a new Souverän model each year. I didn’t know that about the 1005 Stresemann. What a shock that the 600 line won’t see one or will be the last to see one! 😉 Do you have any reason to doubt that an Olivine 205 or 200 will be coming later in the year? Haven’t they done a pen for every ink of the year? I’ll certainly be more excited to see that pen than this 205 demo. The M1005 Stresemann has not been widely announced but is expected for later this year. I haven’t posted about it simply due to lack of details. Given that we would then have M405, M805, and M1005 versions in the same finish, it makes sense that the M605 line-up would be due next. I have no reason to doubt an Olivine M2xx release. Don’t let a new M205 deter you. When the light blue M205 demo was released in 2016, we still saw the IOTY Aquamarine model released. These are usually announced June/July so stay tuned. Good points. I do still expect we will see a 205 or 200 Olivine later this year. As for a potential M605 Stresemann, I was having some fun with the old idea that the 600 series doesn’t get the attention it should from Pelikan. Considering the recent white and turquoise releases, perhaps that isn’t as much of a sore spot for some Pelikan fans. It would still be something to take note of if every series gets a Stresemann but for the 600. I’m thinking that we may see a Stresemann M605 within the next 1-2 years but that’s just a guess. Only time will tell and Pelikan tries to keep things pretty close to the vest these days. The Aquamarine is, IMHO, the best M205 to come along. Unless you don’t like teal. I will 100% agree with you provided that you are talking demonstrator M205s though I’m very hopeful for what an Olivine M205 might look like. If you’re looking at the broader category of M205s, that red one is a personal favorite. I’ll pass. Not even for the sake of a complete line in the collection. And I have to agree, for the earlier excitement of what might be coming in 2018, the first 4 months of the year have not set my interest, or my wallet, on fire. Thanks for the preview Joshua! I envy your ability to keep your wallet closed. I should try and learn rom you. Alas, when one’s wallet closes to one pen, it often opens to another. I own one Classic Pelikan Fountain pen (Green), and one Classic Green Ballpoint Pen and one Classic Black Ballpoint Pen. Love it, is very elegant, writes excellent, for me this is “Rolls Royce” in pens department. I do calligraphy, so I love pens. I have a few Mont Blanc, Waterman, Parker but Pelikan is my very favorite !!! A very capable flock. I like the “Rolls Royce” description. I have felt similarly before I went exclusively Pelikan. Demonstrator should be a regular edition though .I can see how transparent demonstrator looks better than regular pens , especially with TWSBI popularity raising .Also it is more sensible if you use colourful inks .And it doesn’t feel very unique as it is perfectly transparent , possible another 10year later new edition will be same too . 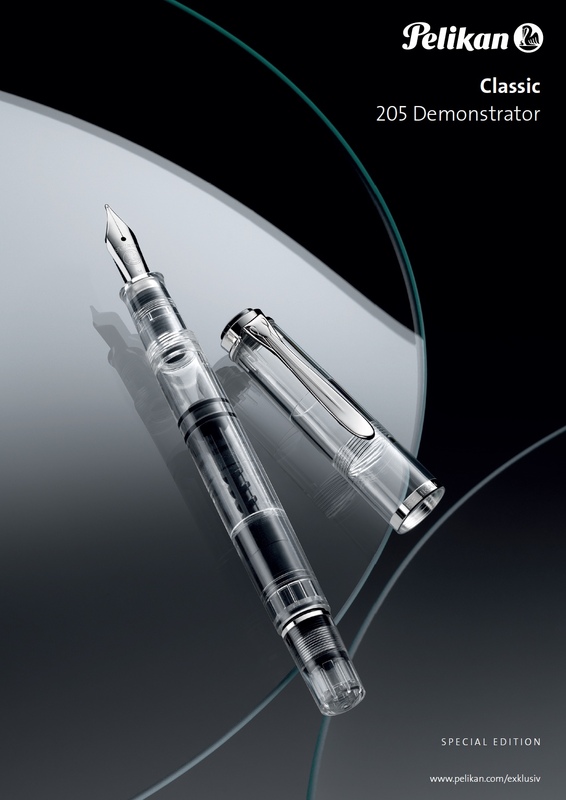 I don’t think Pelikan has ever made a “regular” edition demonstrator in any of their line-ups. I wouldn’t mind that though since demos show their scars more so than other pens and it would be nice to be able to easily replace if desired. I think that you captured a bit of the essence of Pelikan with your sentiments. To me, it feels as if the pens transcend the sum of their parts. Not necessarily anything special but there is something about the experience of writing with one that just takes it to a whole other level. Exactly! I always wondered why these pens were so revered when they didn’t seem to be *that* special… Well, now I know (and I’m hooked)..! Thanks for such a great site BTW! You’re most welcome and thank you for the kind words. I already have the M805 demonstrator along with a M200 Cognac and Smoky Quartz demonstrators. It seems to me that Pelikan f pens are, by far, the best quality and value out there. They certainly surpass Visconti pens, specifically the Van Goghs and Rembrandts. Pelikan pens are indeed high quality though I don’t know about the best value, at least not across the board as prices have steadily risen over the years. You have a nice flock there. They are a bit pricey but I find I keep getting them (m200/205 anyway) as the years go on. With a decent discount the price is palatable for how much I like them. I like them a lot which is why when I started collecting Pelikan, I dedicated my efforts towards accumulating models from the Classic Line. Now I own all but two to ever be released. I have the demonstrator with the gold trim with an EF nib and I love it. I enjoy using a wide variety of ink colors which I change frequently. With this pen, I know at a glance it’s currently inked with which color. And any ink left after the usual cleaning, is easy to flush out with a syringe. I’d buy this pen again in a heartbeat. My experience has been the same. I didn’t think that I would like demos when first starting out but then got into them in a big way. The Pelikan Demonstrators intrigue me; having never seen one in person, I am trying to determine if I would enjoy the inked-up reality, and/or what might end up bothering me. Could you please say more about the following, especially what you mean by “acquired imperfections”…? Demos all come down to how OCD you are. Certain inks stain. In many pens, that’s a non-issue because it’s not all that visible. In a demo, that can be a long term blemish that can mar the look of the barrel. Easily overcome if you choose your inks wisely and clean your pens regularly. If you leave inks in a pen for months at a time unused, a demo probably won’t look as good in the long term. I wouldn’t be afraid of a demo pen though. Hope that helps answer your question. Yes, it does– thanks! Even better: your explanation, and video demonstration of cleaning the section! I greatly appreciate your taking the time to put all this together. It was my pleasure. Glad that I’ve been of some help to you. Don’t hesitate to let me know if you have any additional questions. I understand your reservations about yet another clear demonstrator, but I bought one since I don’t own any other. I am quite happy with it, in fact. Mine is on the way still. Should be here Monday. Glad that you’re enjoying yours. The M200 clear demo and its re-issue are indeed easily distinguished by the transparent piston mechanism. It looks like the original M205 and its reissue are destined to be much more alike. The biggest differences between the two are the piston knob and the cap top. Hi Joshua. I just received mine in an extra fine. I flushed the nib and feed and loaded it up with Platinum Carbon Black to do some stealth sketching. I missed out on the old one. I have one with a gold plated steel EF nib that is a dream, but it is black, and hard to see the ink level. I wasn’t expecting to be surprised by the m205 clear demo, but it is MUCH nicer and feels like a quality instrument. The nib is smooth as heck, but the line is just a hair wider than the gold plated EF. It is still an extra fine though and performs like a champion. There’s even a little bit of spring to the nib. Lots of fun. I just wanted to share that and thank you for all that you do. Thanks for sharing your experience. You have a great pen. I like the look of the newer one with the metal cap crown just a bit better than the prior release. Enjoy it! The original ones can be hard to come by. They do come up for sale but rather infrequently. Glad to hear that this scratches such a long suffered itch. These are pretty durable if cared for properly but always good to have a spare. Enjoy it!